On September 12, 2016 February 16, 2018 By felicitousfelixIn Are There Lesbians? Several teenagers with special powers fight ghostly threats, which may herald an even greater threat for 1920’s America. Yet again I am beating myself up over not starting on a series sooner. On the plus side I suppose this means I have less time to wait between books. 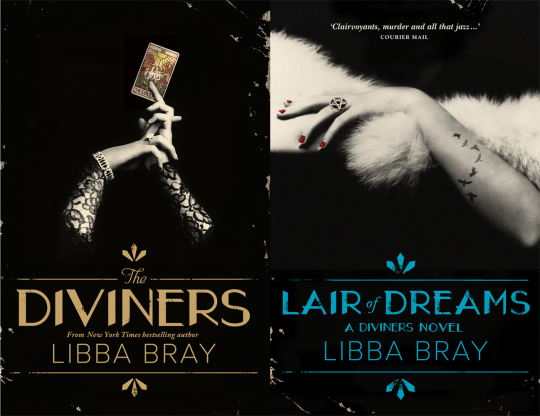 Having said that however, the third book in the Diviners series doesn’t yet have a release date, but it should be out some time next year. I found the subject matter of both books fascinating and feel that they do a good job of showcasing the wonders and possibility of the American Dream in Prohibition era New York, while at the same time undercutting this with a Fitzgerald-worthy nihilism regarding said dream. Primarily the novels do this through their vast cast which contain a relatively even guy/girl ratio, queers, and people of colour. With such a diversity of viewpoints, we are able to see how events affect certain characters and their families, but also how their personal and ancestral history affects their responses. One of my favourite ways in which this was done was in Lair of Dreams which is primarily set in Chinatown and focuses on a half-Chinese main character. It was wonderful to see traditional beliefs and culture woven through the text and, in fact, act as the core mythology for that book – after all when dealing with a Chinese ghost it makes sense that Western methods of putting them to rest wouldn’t work. It is important too that the novels do not sugar coat or gloss over the racism of the period. The theory of eugenics plays a role in each of the novels and I have a feeling that as the series continues we will only see this grow. With such a wide variety of cast members it is wonderful to see relationships develop despite class and race lines. After all, these are people brought together through powers they themselves don’t fully understand and on top of this – with murders to solve no one really has time for judgement. Friendships are shown to be just as important as romantic relationships, which is always encouraging to see. That being said, I do love a good romance and my favourite is definitely the burgeoning relationship between Theta and Memphis. Their relationship also has what I guess you could refer to as an “added bonus” of being an interracial couple which at the time would have been scandalous in and of itself, but in this case particularly so because it is between a black man and a white woman. As I mentioned before – the racism of the times is not sugar coated and this lovely couple are met with disparaging remarks from members of the general public and, occasionally, friends and family, who at the very least have some misguided good intentions. Which is understandable when you don’t want to see your friend dead. Gender roles for characters are not enforced by the author or by their close peers – girls are badass, guys write poetry and play music and everyone is in love with everyone else. It’s a wonderful hodge-podge of characterisation, with each character being likable despite their flaws. Once again I found myself not worrying about wanting to hear from a certain POV as everyone has such wonderful adventures and intriguing stories of their own, so I simply enjoyed learning their personal history which never comes at the cost of furthering the story, because more often than not, their past is directly affecting the present. The Diviners is an amazing series, full of magic and wonder and just a little creepiness to keep you awake at night. I’m forcing everyone to read it!